A new artist-focused campaign claims that British culture is stronger in Europe than out, with its recently launched website providing a platform for artists to make the case for staying in EU. 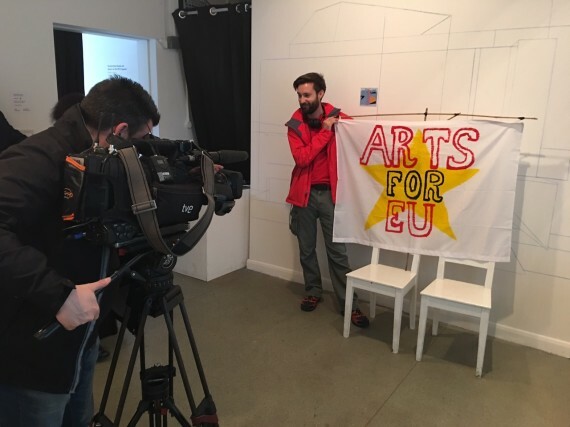 A new campaigning group led by artists is calling for an ‘in’ vote in the EU referendum in June. @artsforeu is led by artist and AIR Council member Joseph Young, Nico Heller of The Democracy School, and artist and writer Dan Thompson. The group has support from Furtherfield gallery, the curators of Kensington and Chelsea’s InTRANSIT festival and the official endorsement of the national office of CVAN. The main focus of the campaign is online, with the website www.artsfor.eu acting as a curatorial hub for artists’ works exploring European cultural identity. Young explains: “We will be offering artists – through an open call – the chance to submit new or existing works that deal with the issue of cultural identity in the broadest possible sense. This might be an image, text, a film, or a piece of music.” Invited artists will each be given a unique login to the site on which to design and present their work. The group has also posted a Call to Action film, A Declaration for Europe, which is now live on YouTube.